Astounding.... One is lead to wonder where the much vaunted American freedom has disappeared. There is a long thread about this on flytalker forums. Right now, it is 65 pages long. When I first read this, I just sat still in front of the computer wondering whether I should laugh hysterically or just cry... For all the trouble VOA (Voice of America) goes to, to spread propaganda about the superiority and harmony of the American way of life, this incident totally negates it. Ramadan is finally here! The first fast is tomorrow. A very happy Ramadan to Muslims all over the world. May we all benefit from this as much as humanly possible. May Allah help us return to the right path. Amen. I just heard the news that the father of a good friend of mine passed away this morning. I request all of those who read this (without regard to what religion you follow or believe in) to pray in whatever way or form you can for him to have a good afterlife. May his spirit rest in peace and his sins forgiven by Almighty Allah; the most forgiving of all. May Allah give my friend and his family the courage to carry on through life's challenges. "To Allah we belong and to Him is our return"
During a visit to his home country Germany, Pope Benedict XVI made some dangerous comments regarding Islam. The pope made his remarks on Islam in a speech in which he quoted from a book recounting a conversation between 14th century Byzantine Christian Emperor Manuel Paleologos II and an educated Persian on the truths of Christianity and Islam. "He said, I quote, 'Show me just what Mohammed brought that was new, and there you will find things only evil and inhuman, such as his command to spread by the sword the faith he preached,'" he quoted the emperor as saying. How absurd can he really be? 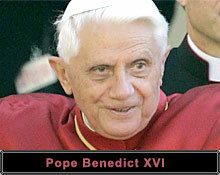 My opinion of Pope Benedict has taken a massive blow from his statements against Islam which lack any good reasoning to back them up. I recently came across some cartoons of holocaust on the internet. 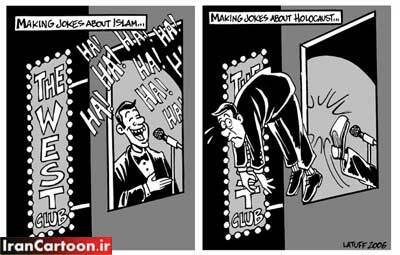 These cartoons are from the holcaust cartoon exhibition being held in Iran. While there are many cartoons on the site, the two which particularly appealed to me are the ones below. 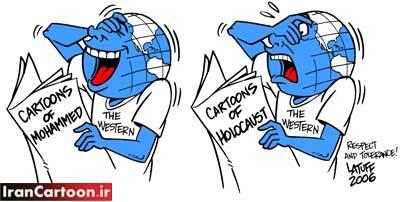 They have little to do with the holocaust but much to do with the double standards displayed by the western media and many people, regarding how they treat Islam (and Muslims as a result) and Jews (and the holocaust as a result). It all comes back to freedom and where it should be curbed to prevent hurting any particular group of people. These two cartoons are quite true, in my opinion. I haven't seen all the cartoon enteries yet since the collection is huge. When I bought my MSI K8N Neo4 Platinum SLI board last year (November, 2005), one of my intentions was to dabble into the world of overclocking. I bought an AMD 3200+ processor alongside it. The default FSB at which the processor operates is 200MHz. I will be referring to the hypertransport speed as FSB since I am more used to it. The motherboard is great for overclocking. However, my particular combination of this board with a Winchester core CPU is not a good overclocking combination. When I started overclocking, it went fine till 219MHz. When operating at an FSB of 220MHz, the board refused to boot until it was reset. After spending so much money on my PC (~$1500) and encountering this issue, I was greatly disappointed. Today I participated in the first ever International Conference on Advances in Space Technologies (ICAST 2006) at the Marriott Hotel in Islamabad. This 2 day conference has been organized by the Institute of Geographical Information Systems (IGIS) of National University of Sciences & Technology (NUST), Institute of Electrical and Electronics Engineers (IEEE) Islamabad Section and IEEE / AESS (Aerospace and Electronic Systems Society)/ GRSS (Geosciences and Remote Sensing Society) Societies Joint Chapter. This is the 1st International Conference of the envisaged biennial conferences of ICAST series. Just saw the video by Riz MC (Rizwan Ahmed) at the link above. It is humorous, though admittedly controversial. The song pokes fun at the post 9/11 world and the way politics has invaded all of our everyday lives. This song has been banned from UK Radio. So much for freedom of speech and expression.